Bluetooth speakers are everywhere these days, but are they really worth it? Check out these 5 reasons to buy a Bluetooth speaker to see for yourself! When Bluetooth speakers first came out, I honestly didn’t really “get” why I needed one. I mean, I still had a small stereo and plenty of radios, not to mention my smartphone that could play music so it seemed like a waste of money. However, I was gifted one a couple years ago, and now I have multiple! So, if you’re like I was and don’t really understand why Bluetooth speakers are so popular, check out these 5 reasons to buy a Bluetooth speaker and find a deal at the end of the post to get even more bang for your buck. I love that you can easily attach this Bluetooth speaker to your gym bag, purse or even your belt loop. It’s also splash-proof for the bathroom. 1. Bluetooth speakers are easy to use. I love that with Bluetooth speakers you can connect any device with Bluetooth whether it be your phone, tablet or computer. All you usually have to do is turn Bluetooth on your device, press a button on your speaker and then go through a couple steps to pair the devices. After that, whenever you turn on the speaker your device will usually automatically connect. So much easier than trying to setup speakers and stereos of the old days! Plus, they’re not just great for music, but also if you do a lot of conference calls or just want your speaker calls to be louder. 2. They’re super portable. If you’re a fellow music lover, you love listening to music just about anywhere. When you’re working out, in the shower, in the car, trying to fall asleep and anytime in between. I love that most Bluetooth speakers are small, thus being very portable so you can take them anywhere. I enjoy being able to have music playing in the kitchen while I cook, but if I take a minute to sit on the couch and check my phone, the music keeps playing uninterrupted. 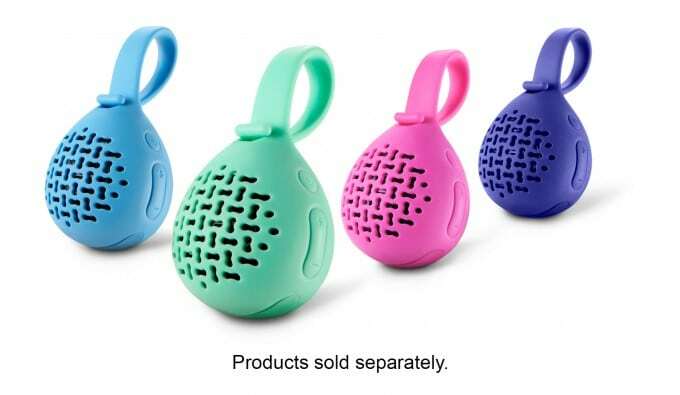 There are even kinds of Bluetooth speakers you can attach to your gym bag or shower head. I love this Plugin Insignia Bluetooth speaker because you can charge devices from it, have it plugged in (or it charges and has about 2 hours of playtime). It even has an aux port for non-Bluetooth devices. Mine stays plugged-in in our kitchen! 3. They save space. I remember when I was a young teen, before cell phones and MP3 players were really a popular thing, wanting nothing more than a decent small stereo to play my music on. Even those took up a good chunk of space! Today, I much prefer having a small Bluetooth speaker plugged in or sitting on the table. They take up so much less room and most sound just as good, too. 4. You no longer have to deal with cables or wiring. One of the biggest features I love about Bluetooth speakers is that they’re wireless. No plugging into a headphone jack. No trying to figure out where approximately 20 cords and wires plug into and then trying to neatly hide them from view. Just let it charge or add batteries and you’re good to go. 5. They’re budget-friendly. Even a small decent stereo system will set you back at least a couple hundred bucks these days, while a good quality Bluetooth speaker can be under $10. I’m always looking for the best buy, so the Bluetooth speaker in the no-brainer choice here! If you’re inspired to buy your own Bluetooth speaker now, you’ll want to follow this link to grab a Best Buy Coupon for 30% off any Insignia Portable Bluetooth Speaker! Now that you’ve read these 5 reasons to buy a Bluetooth speaker are you going to buy one or have other reasons you already love yours?